Ah, the buffet table. The never-ending choice of culinary options, healthy and unhealthy. What do you pick? Is it the item you like best, the one that is best for you, or a combination of both? Why don’t you ask your skin? The skin is the largest organ of the body, and the outer fingerprint of inner health. That means that when it comes to food choices, your skin should have a lot of input. What would your skin pick from the buffet table? While you can’t directly ask it, luckily researchers have done a lot of the work in taking the guesswork out of it for you. Here is a sample of what they have to say. You may have heard of EVOO (extra virgin olive oil) and its superfood status. That comes in part from its reputation as an anti-ager for the skin. 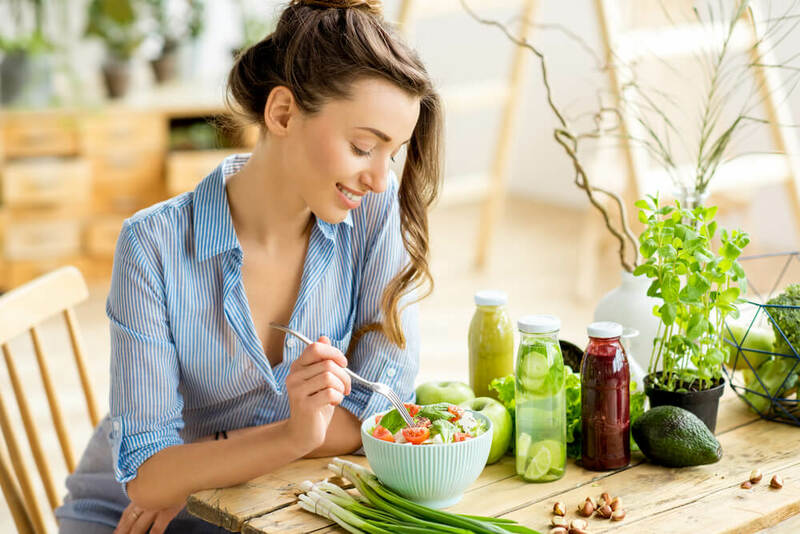 According to a 2012 study in PLOS One, women who consumed more than 2 teaspoons of olive oil per day showed 31% fewer signs of aging that those who ate less than one teaspoon. The fat in olive oil is 75% mono saturated fatty acids, which have been shown to decrease skin aging, and the antioxidant polyphenols in the oil help to fight free radicals which can contribute to the aging process. Tomatoes are another great addition to your Skin Menu. A 2008 UK study showed that people who consumed 5 tablespoons of tomato paste and a tablespoon of olive oil daily, for a period of 12 weeks, showed a 33% greater increase in sun protection than those who ate only olive oil. Tomatoes contain lycopene, which has been associated with increasing the skin’s natural SPF. Note: Cooking tomatoes raises lycopene levels. Chocolate, good for your skin? Apparently, aside from the sugar level, chocolate is a definite skin friendly ingredient. The flavanols in chocolate contain antioxidant properties to improve circulation and keep skin hydrated. In fact, women who consumed a flavanol-enriched cocoa powdered drink for a 12-week period reported less skin dryness and roughness compared to those who did not drink the cocoa. While the test group consumed the equivalent of 3.5 ounces of dark chocolate, Lisa Drayer, MA, RD, suggests keeping chocolate consumption down to a one ounce portion to reap the benefits without the calories. If your idea of a typical breakfast is a bagel and jelly, you may want to rethink your choice. Apparently the bagel and jelly combo is a double threat to the skin, offering refined carbs which stimulate insulin and androgens in the body. Drayer says,”Elevated androgens cause sebaceous glands in the skin to secrete more oil that gets trapped inside pores, causing pimples.” Apparently, this is not the case with oatmeal, although experts advise swapping out the brown sugar for natural fruit. Big things come in little packages. One serving of sardines contains 1.5 grams of omega-3 fatty acids, putting it at the top of the list of good fat sources. Like other fatty fish, sardines are rich in an anti inflammatory omega-3, called DHA. Dr. Jessica Wu, MD, says, “inflammation is now known as the root cause of acne.” Eat sardines for clear skin. What’s your skin menu like? Let us know what the best diet is for your face. We want to know!